Printed circuit boards (PCBs) form an integral part of any electronic device and serve as the foundation of a majority of electronic products. They are functional centers of most electronic devices and are used to connect various electronic components mounted on them, thereby forming an assembly or circuitry meant to perform various functions. Conformal coatings are protective chemical coatings that protect electronic circuit boards from harsh environments that contain moisture, salt, or other contaminants. Conformal coatings ensure operational integrity of the electronic assembly by preventing it from voltage arcing, shorts, and static discharge. Generally, conformal coatings for the protection of printed circuit boards are based on acrylic, silicone, polyurethane, epoxy, parylene, etc. Acrylic conformal coatings can resist abrasion and can be easily applied or removed for repair or rework. They provide fair elasticity and are recognized for their high dielectric strength. Silicone conformal coatings provide superior chemical resistance and salt spray resistance. They are very flexible. Removal of silicone conformal coatings is quite challenging as it requires specialized solvents and long soaking time. Polyurethane conformal coatings are known for their superior resistance to moisture and chemicals. They offer high abrasion and excellent adhesion to a wide variety of substrates. Epoxy conformal coatings are generally available as two-part compounds. These conformal coatings provide resistance to humidity and high resistance to abrasion and chemicals. Once cured, they are very difficult to remove. Parylene conformal coatings are a special type of coating applied through vapor-phase deposition. They offer excellent dielectric strength and superior resistance to solvents and extreme temperatures. Fluoropolymer-based conformal coatings are generally dissolved in a fluorocarbon-based carrier solvent, and they are applied as a thin coat. Solvent-based conformal coatings are used for coating applications owing to their cost effectiveness and ease of availability. Water-based technology is environmentally friendly, and manufacturers are striving to produce conformal coatings that employ water. The major advantage of water-based conformal coatings is reduced emission of VOCs. Use of UV-cured technology results in coatings that are VOC free and non-flammable. Conformal coatings are exposed to UV radiation for fast curing. UV-cured technology is employed for conformal coatings that are applied over PCBs exposed to harsh environments. Conformal coatings are used for the protection of PCBs of consumer electronics appliances. In the automotive industry, PCBs are used in surrounding monitors, control systems, navigation systems (GPS), and audio and video devices. The coatings are used in factories and manufacturing facilities for protecting PCBs from harsh chemicals and rough handling. The medical applications of conformal coatings include monitors, scanning technologies, control systems, internal devices, scientific instrumentation, etc. In the marine industry, conformal coatings are used under the dash of high-performance boats and exterior equipment used on larger maritime systems. Conformal coatings in PCBs are also used in defense, aerospace, nanotechnology, and green energy technologies. Aerospace applications of PCBs require a great deal of precision and durability as they operate in extreme conditions. Aircraft often go through significant amounts of turbulence in the atmosphere. Normal PCBs might get damaged during such harsh conditions. In order to avoid this, flexible PCBs are used in the aerospace industry. Delamination in conformal coatings is the removal of the conformal coating from the surface of printed circuit boards. This process leaves the circuit board area exposed. Delamination is related to factors such as cleanliness, compatibility, permeability to moisture, degree of coating cure, etc. If the surface of the printed circuit board is contaminated, delamination of conformal coatings may occur due to poor adhesion of the coating to the laminate. Difference in surface energies of the coating and the substrate of PCB often leads to poor compatibility. Key manufacturers such as Dow Corning, Henkel AG & KGaA, and Shin-Etsu Chemical Company Limited, with significant production capacities, dominate the global conformal coatings market. Large players are highly integrated, which helps them reduce production costs and gain a competitive edge in the market. Key players focus on new innovations and technologies in order to enhance their market share and serve diverse industries. These prominent companies have an advantage due to their extensive presence across the value chain, as compared to other manufacturers of conformal coatings. Most consumer electronics devices are general-purpose devices, and thus, PCBs used in their fabrication need not be highly reliable. Quality and type of PCBs used depend on complexity of the circuit design. This affects the overall cost of the end-product. Asia Pacific is a significant consumer of consumer electronics devices. Demand for PCBs is directly proportional to the demand for electronic devices. The consumer electronics sector in Asia Pacific was valued at around US$ 300 Bn in 2015. The sector in the region has been expanding at a rapid pace. Rise in population in the region, increase in disposable incomes of inhabitants of the region led by rapid industrialization, and availability of low-cost electronic devices and attractive finance schemes are some of the factors augmenting the demand for consumer electronics devices in Asia Pacific. This has resulted in increase in demand for PCBs in the region. Consumption of consumer electronics is high in countries such as China, India, and Indonesia. These countries offer significant potential for future expansion. Printed circuit boards (PCBs) form an integral part of any electronic device and serve as the foundation of a majority of electronic products. They are functional centers of most electronic devices and are used to connect various electronic components mounted on the PCBs, thereby forming an assembly or circuitry meant to perform various functions. Conformal coatings are protective chemical coatings that protect electronic circuit boards from harsh environments that contain moisture, salt, or other contaminants. They ensure operational integrity of the electronic assembly by preventing it from voltage arcing, shorts, and static discharge. Generally, conformal coatings for the protection of printed circuit boards are based on acrylic, silicone, polyurethane, epoxy, parylene, etc. Conformal coatings are used in end-use industries such as automotive, aerospace, medical, marine, etc. In the automotive industry, they are used to protect electronic systems in applications both under the hood and passenger compartments. The environmental requirements of the aerospace industry, where rapid compression and decompression can affect the performance of the circuitry, necessitates the use of conformal coatings. In the medical industry, the key application of conformal coatings is in pacemakers. Conformal coatings protect PCBs from chemicals, moisture, and other harsh environments. Advancements in the consumer electronics, automotive, medical, and defense sectors are paving the way for the expansion opportunities for the conformal coatings market. Sales of conformal coatings in the Asia Pacific region were high compared to those in other regions owing to the robust electronics manufacturing industry in countries such as China, South Korea, Japan, and other South East Asian Nations. Coating technologies such as solvent-based technology, water-based technology, and UV-cure technology are commonly employed in the conformal coatings market. The solvent-based coating technique is a highly used technology, whereas both water-based and UV-cure technologies are gaining popularity as they do not emit volatile organic compounds. Manufacturers are continually developing greener coating technologies, which helps them in minimizing solvent emissions and their impact on the environment. UV-cured technology is 100% solid based and hence does not emit volatile organic compounds. Manufacturers of conformal coatings strive to minimize the environmental impact of their operations by reducing emission of VOCs. The Environmental Protection Agency oversees regulations to control volatile organic compound emissions. Governments across the globe are undertaking initiatives regarding e-scrap legislations due to concerns about handling of electronic waste and the emission of volatile organic compounds it. The report analyzes and forecasts the market for conformal coatings for PCBs at the global and regional level. The market has been forecast based on revenue (US$ Mn) from 2018 to 2026. The study includes drivers and restraints of the global conformal coatings market for PCBs. It also covers the impact of these drivers and restraints on the demand for conformal coatings for PCBs during the forecast period. The report also highlights opportunities in the conformal coatings market for PCBs at the global and regional level. The report comprises a detailed value chain analysis, which provides a comprehensive view of the global conformal coatings market for PCBs. The Porter’s Five Forces model for the conformal coatings market for PCBs has also been included to help understand the competitive landscape. The study encompasses market attractiveness analysis, wherein applications are benchmarked based on their market size, growth rate, and general attractiveness. 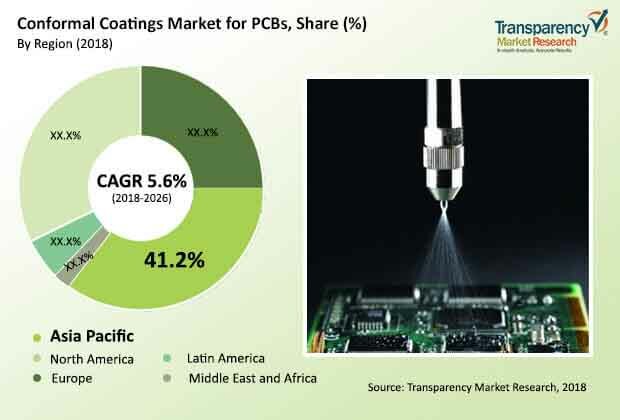 The study provides a decisive view of the global conformal coatings market for PCBs by segmenting it in terms of grade, application, and region. These segments have been analyzed based on the present and future trends. Regional segmentation includes the current and forecast demand for conformal coatings for PCBs in North America, Europe, Asia Pacific, Latin America, and Middle East & Africa. The report also covers the demand for individual application segments in all the regions. The study includes profiles of major companies operating in the global conformal coatings market for PCBs. Key players profiled in the global conformal coatings market for PCBs include Henkel AG & KGaA, Chase Corporation, Dow Corning, Shin Etsu Chemical Company Limited, HB Fuller, Electrolube, Chemtronics, and MG Chemicals. Market players have been profiled in terms of attributes such as company overview, business strategies, recent developments, financial details, etc. The report provides the estimated size of the conformal coatings for PCBs market for 2017 and forecast for the next nine years. The global size of the conformal coatings market for PCBs has been provided in terms of volume and revenue. Market numbers have been estimated based on metal, end-user, and region. Market size and forecast for each grade and application have been provided in terms of global and regional markets. It includes detailed Porter’s five forces analysis and value chain analysis. These comprise integration among market players along with identification of potential key customers of conformal coatings for PCBs.